That seemed to sum up how skittish officials can get about issues of regulating an industry seen as both a bonanza and an environmental problem amid the lush woods and fields of the upper Susquehanna River. Landowners often were left responsible for figuring out what’s best. But was there enough information for the market to function equitably? “When they first came, they said this is what the offer is, it’s never going to be anymore,” the elderly farmer’s wife recalled. “They’re in business. That’s what they do. And of course since then, it’s 300 times what we got,” she explained of the rising value of subsequent offers to others leasing land after them. Interviews with a score of residents last summer showed that people in Dimock (mainly in either farming or factory-worker families) neither were aware of the value of their land, nor understood what Cabot would be doing with it. There had been very little research done on Marcellus Shale natural gas drilling before it swept across Pennsylvania. 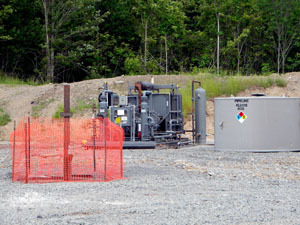 Unlike New York state, where a significant portion of the Marcellus Shale area has seen drilling delayed by a moratorium, state and local regulating officials in Pennsylvania faced a crisis due to a lack of resources to do necessary research or put into place the necessary protective guidelines. Furthermore, because these regulating agencies were the primary public source of information on Marcellus Shale, citizens were not fully informed about Marcellus Shale natural gas drilling, and therefore could not make educated decisions about leasing their land to natural gas companies. And companies drilling the Marcellus Shale would not be just a one-year wonder here. Less than 50 Marcellus wells existed in Pennsylvania before 2005. In 2008, 195 wells were drilled and that number increased to a whopping 768 in 2009. The lease agreements made between Cabot and landowners in Dimock are set to last for as long as gas is produced, a minimum of five years. Still, there’s no guarantee that drilling on your land means you will receive any capital. The hydraulic fracturing process uses both vertical and horizontal drilling. Once the well has been drilled and cased, frack water can be sent into the well at a very high pressure to induce fracturing in the shale, in turn, releasing natural gas. In some cases, the horizontal part of the well will extend into a neighbor’s property. A Marcellus well drilled on your property that extracts gas from another property won’t receive any royalty because the natural gas being extracted originated on another property. Of course the landowners producing gas will receive royalties during that time period but it’s questionable if those royalties will outweigh all of the risks involved in leasing land to be hydrofractured. And with the speed at which the number of Marcellus Shale wells grew since 2005, uncertainty of the actual risks in such deep drilling becomes a risk in itself. Yet as with most things concerning resource extraction in Pennsylvania, the history runs deep, too. Four decades ago, during the last major U.S. oil crisis, the prospect of affordable energy was in question, marking the start of a then-slow push toward natural gas extraction in Pennsylvania. Artists Rodrica Tilley and Michael Poster, sitting in their yard in neighboring Montrose, expertly landscaped to encourage the natural beauty around us, reminisced about how tough it was just to get a tank of gas back in 1973. “You had to plan your life to get gas for months,” Rodrica said. “There were lines at every gas station.” The United States had been cut off from oil exports from a number of different Middle Eastern countries. Petroleum was in short supply and prices were sky high. While natural gas may burn cleaner than diesel, diesel is still a necessary ingredient in the production process. Thousands of diesel trucks running through Pennsylvania are needed to operate a natural gas well pad during its lifetime, not to mention the fuel it takes to transport this gas to its final destination. In a sense, fossil fuels are paradoxically a requisite to further fossil-fuel extraction. Natural gas, rather than a source to reduce dependence of oil, turned into another source of profit for the energy industry.